Your team members, however, are spread out over multiple remote locations, meaning that rounding them up would be unproductive. Using Web conferencing technology, however, the process is simplified. Onstream Meetings’ conferencing solution allows end users to log into a meeting over any mobile device or computer, using nothing but a standard Web browser. End users do not have to install any software or application; they simply enter a password from a location that has Internet connectivity to join the conference. Once end users are logged into the conference, they will have access to a full suite of communications features capable of engendering professional, real-time interactions. End users can edit documents in real time, engage in text, audio and video chat, and even break down into small groups to complete individual assignments. Using Onstream Meetings’ advanced technology, your team will be able to communicate better than they could in a face-to-face meeting due to the variety of tools available at their disposal. Onstream Meetings comes with over 100 features that can be used to ensure crystal-clear collaboration sessions. 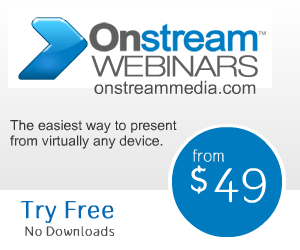 Want to learn more about how Onstream facilitates easy remote interactions among employees? Click here to read our article on how we meet the needs of today’s remote workforce.